I love humor. I love sarcasm. I love not taking life too seriously. Humor, is my therapy. Humor, at times, is my defense mechanism when I’m feeling like life gave me the short end of the stick. I believe from the bottom of my heart laughter is the best medicine. I believe humor is good for the soul. Most importantly, I believe when I have a gut-busting 10 minute laugh that I’ve completed my ab exercises for the day. Wise, modern words from good ‘ol Willy! Table Tonic put together this fun printable. Check it out here. By the way I just recently started following the movie comedian on Twitter and he’s puh-reety funny! I shared this card with Delightfully Noted friends on Facebook not too long ago. I thought it was hilarious and I still laugh every time I read it. 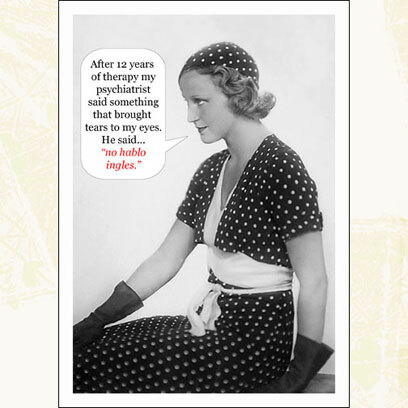 If you’re looking for more giggles head on over to Frankly Speaking Vintage Greetings and check out all their designs. Hope you all have a delightful weekend. Peace, Love, & Laughter! I love having one of those can't-breath-I'm-laughing-so-hard moments. :) That Will Ferrell cracks me up. Going to have to check him out on Twitter. Haha that greeting card is hilarious!!! And I didn't know Will Ferrell has a twitter - so cool! I'm going to check that out. Thanks for the lifter-upper!! Love it!